Rebecca Li’s artwork, titled “Wing of Words” has been recognized with an Honorable Mention in the visual arts category. Emma Cheatham’s artwork, titled “Get Lost in a Book” and Grace Farrell’s artwork “Good Afternoon Aliens” have been recognized with Awards of Merit in the visual arts category. 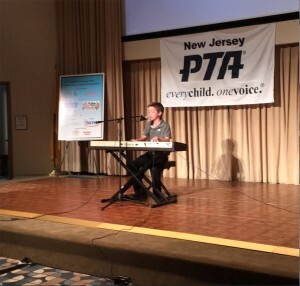 Raffaele Rogers’ song “Fly” was recognized with an Award of Excellence in the musical composition category and was sent on to represent New Jersey at the National PTA Reflections Competition. Li’s, Cheatham’s and Farrell’s artwork was on display and Rogers performed his song on April 16 at the New Jersey PTA 2016 Reflections Arts and Award Ceremony in Princeton. These winners and all students who participated in the program were recognized by the Haddonfield Board of Education on May 19. Participants in the program included Katarina Kuball, Rafael Lytle, Maggie Dunn, Graham Brock, Lucia Marone, Sophie Rowell, Lily Rowell, Caroline Asselin, Lucy Cheatham, Mary Bentley, Katherine Schaffer, Joey Cittadini, Ava Ippolito, Nelson Thayer, Clementine Thayer, Maeve DiMarino, Mia Bompensa, Pilar Caruso, Audrey DeCristofaro, Audrey Kelly, and Connor Paoli. The 2016–2017 theme is “What Is Your Story?” For more information about the program, contact your school’s PTA Reflections Chair or visit PTA.org/Reflections.